Network Services Company honored four of its preferred suppliers for outstanding performance in 2005. The awards were presented at Network’s 2006 supplier trade show in Hollywood, FL. Kimberly-Clark Professional was named Supplier of the Year. Kimberly-Clark provides Network’s members with tissue and personal care products for away-from-home restrooms and workstations, and was ranked highly on the members’ evaluation of suppliers. Heritage Bag Company was recognized as National Account Supplier of the Year. Heritage, which produces can liners, food bags and utility bags, worked closely with Network to grow its national account business. Handgards, Inc. was honored as NP&PC Supplier of the Year. A manufacturer of polyethylene gloves, bags and other products for foodservice and industrial use, Handgards was recognized for outstanding support of the sales programs for National Paper & Plastics Company, Network’s redistribution service for its members. Shurtape Technologies, which produces a variety of tapes for a number of industries, was given the Rising Star Award. Shurtape achieved outstanding sales growth to the Network members in 2005. Network has more than 100 preferred suppliers. All four suppliers honored this year achieved increases in their sales to Network members and customers, and participated fully in Network programs. Headquartered in Mt. Prospect, IL, Network Services Company distributes janitorial supplies, foodservices disposables, industrial packaging products, and, through its NetPrint division, printing materials. It sells similar products in Europe through its newest member, INPACS, and through an alliance with Igepa, a printing paper distribution group. Both are based in Germany. 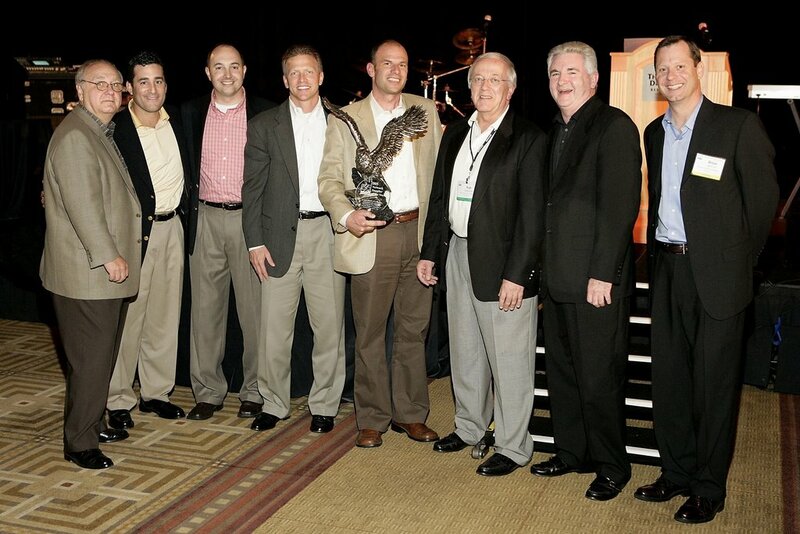 Network named Kimberly-Clark its Supplier of the Year. From left to right: Network CEO Jim Alexy, Gil Madrid, Don Scuvotti, Rick Nagode, Joe Doyle, Network SVP Walt Dethlefsen, Rick Herbert and Brian McCool.